Research in Motion (RIM) unveiled its first BlackBerry with both a touchscreen and a physical slide-out QWERTY keyboard at a New York City press event on Tuesday. The phone is also the first BlackBerry to run 6 OS. 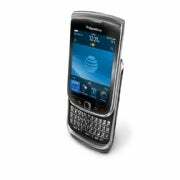 The Torch 9800 will debut August 12 on AT&T for $200 with a two-year contract. Like the Palm Pre, the Torch has a vertical slide-out keyboard. From what I can glean from images of the Torch, the keyboard looks fairly similar to the keyboards found on the BlackBerry Bold models with sculpted, ergonomic keys. A little thicker than some of the other top-line smartphones out right now, the Torch measures 4.4 by 2.4 by 0.6-inches thick. The 3.2-inch 360-by-480 capacitive touch display comes equipped with multitouch (for zooming in and out), which will be supported in the browser and photo gallery. The front face of the phone has four buttons familiar to BlackBerry users: Talk, Menu, Back and Power/End. These buttons flank the square optical touchpad, which can be used for navigation in addition to the touchscreen. Finally, RIM has caught up with the rest of the smartphone pack and upgraded the BlackBerry camera to a 5-megapixel camera. BlackBerry camera's generally have pretty dismal photo quality, so hopefully the Torch steps up its game. The camera also has a flash as well as autofocus, image stabilization and geo-tagging. From what I've seen of 6 OS, I can safely say that BlackBerry users will be pleased with this update. The whole user interface gets a facelift with crisper icons and visuals, new graphics, animations and transitions. There's also a new homescreen with multiple views based on content type (all, favorite apps, downloads, media, etc.) as well as universal search. Perhaps the most exciting feature of BlackBerry 6 OS is the WebKit browser. One of the biggest weaknesses of the current version of the BlackBerry platform is its clunky, hard to navigate browser. Webkit is the same technology behind Apple's Safari browser on the iPhone's OS. 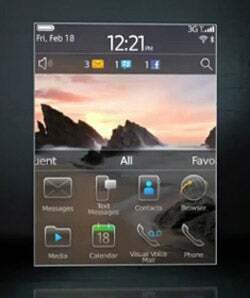 The Android Web browser as well as the Symbian S60 browser are also built around Webkit. And keeping with the trend of social network integration we've seen on other platforms, like HTC Sense for Android for example, BlackBerry 6 will have a "social networking feeds" app that will combine status updates from Facebook and Twitter. You'll also be able to chat with your friends via a slew of different messaging services like Google Talk, BlackBerry Messenger and AIM within one seamless application. RIM's CTO David Yach assured attendees at today's press conference that BlackBerry 6 OS will work with all previous BlackBerry applications. RIM is releasing new APIs that will let app developers integrate BlackBerry 6 OS features into their apps, like the universal search feature for example. Can the Torch compete with the slew of enticing Android offerings, like the Motorola Droid X or the HTC EVO 4G? And how does it stack up against the iPhone 4, also on AT&T? Stay tuned for a closer look at the Torch 9800 and BlackBerry OS 6 as well as a full review once we have the device in house.